Sewing in the modern world is so much different than 30-50 years ago. Innovative technology constantly brings new ways to our creative lives. When I started to sew I didn’t even know the word “serger” (funny that Google doesn’t know it even now) and learned to finish raw edges by hand or by zigzag stitches. Now I have changed 3 sergers already and I am looking to buy another one. Technology is changing rapidly and everyday there are new techniques and gadgets to learn and use. 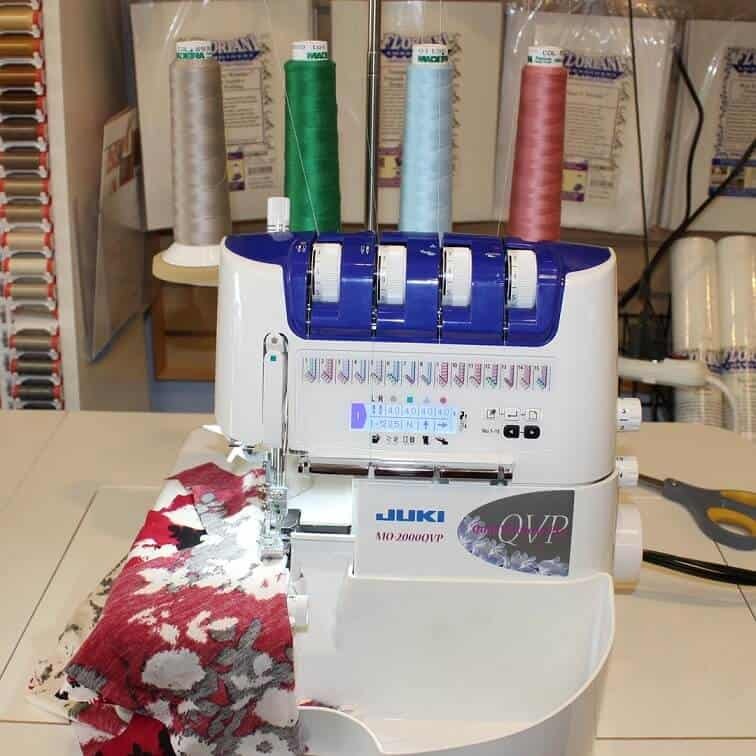 So, this is a review of JUKI serger MO-2000 QVP. First of all, it has an amazing threading feature – so called Air Threading. You just put upper and lower looper threads in small threading holes – and a strong whoosh of air from a motor will bring threads right to the needle plate. Of course, you need to push a button for this. But it couldn’t be easier, really. It works well with regular polyester and cotton threads, and it works well with Eloflex – an innovative stretchable thread from Coats. Very convenient! No more fear or frustration when changing threads. I didn’t try to thread the serger with wooly nylon but people say it works also. I heard from many people that it’s too complicated to change threads in upper and lower looper on sergers without this feature. Some even never changed the threads just to avoid the procedure and because of this didn’t use their serger to its full potential. If you have an old serger you understand what nightmare it is sometimes to thread loopers. Second, JUKI has an auto-threader for both needles – a device for helping to put threads through the eye of a needle! I tested it. It works wonderfully. None of my previous sergers had this feature, even if they were from very high-end, well-known sewing machine companies – Singer, Brother, and Janome. 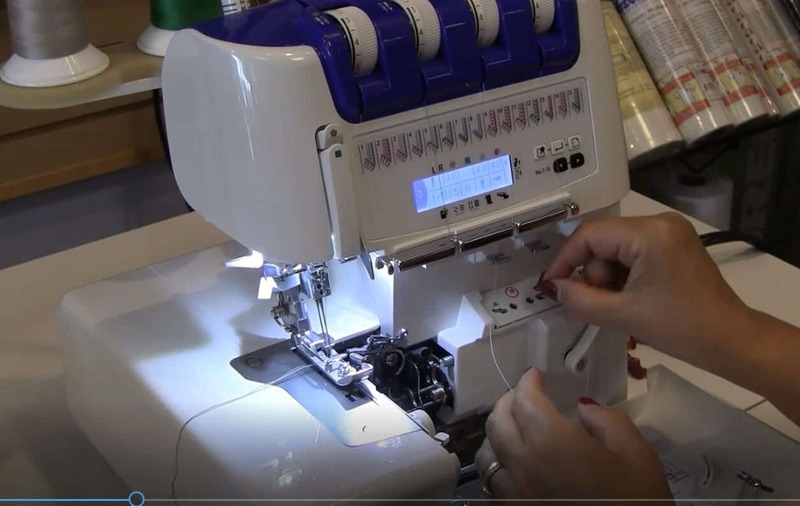 The Juki MO 2000 serger can be threaded in any sequence! With my previous sergers I had to re-thread in the exact given order: upper looper, lower looper, right needle, left needle. I have almost never been able to cheat this threading sequence. When I tried to replace only one broken looper thread I never managed to get the serger to work properly. And it was really hard to remember the sequence without going to the manual. With Juki I don’t have this problem anymore. The thread is broken? No big deal. I can re-thread the machine fast and easy. So no more worries about the threading order. 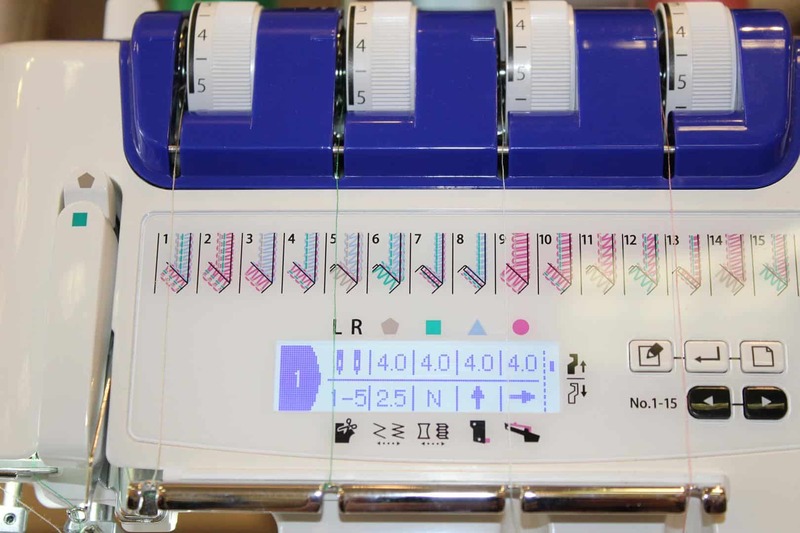 Another great feature (and quite unusual to me in sergers) – LCD Screen with a lot of necessary information about tension, stitch length, differential feed settings, position of needles, knives and loopers. I don’t need to search through pages and pages of my manual what settings are necessary for chosen type of stitching. I simply glance on the Screen and see clear instructions for 15 different stitches. I noticed with my previous sergers that the more stitch types a serger offers the more complicated it is to use. Not the same with Juki. I just press the button, choose a stitch – and all the settings can be found on the LCD Screen! What is the recommended tension? It is on the Screen. Do I use an upper knife? It is on the Screen. What is the stitch length? It is also here. As well as many other necessary instructions for the stitch I choose. Next wonder – I can use just regular sewing machine needles! Universal or stretch or ball point. I don’t need to buy special serger needles anymore. The Juki serger has two step presser foot lifter with integrated front foot lift. To raise the presser foot I lift the presser foot lever on the rear of the machine until it engages. And I can raise it again to the maximum height and held in this position to provide more space between presser foot and stitch plate. It is very nice feature for sewing thicker fabric. A few words about the tension. I don’t need to put it to 0 when changing threads! When the presser foot is raised, all the tensions are released making it easier to thread the machine. The presser foot has clear marks on it to use as a guide when placing the fabric under the presser foot. I have some marks on the presser foot for left and right needle position on my Janome serger but Juki has also a mark for a knife position that represents the position at which the fabric is cut. 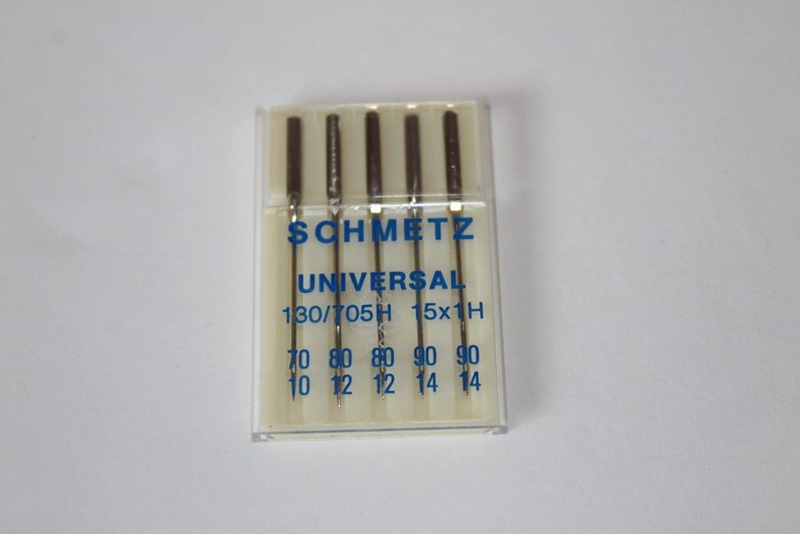 Juki has a very practical small tool – a needle inserter. Needles can be inserted quickly and easily. A very nice feature of Juki serger is its differential feed. Other sergers have it also though. There are two feed dogs – one front and one rear. The two feed dogs move independently and the distance each feed dog travels during one complete movement can be adjusted. The differential feed prevents fluting or waving in knits or stretch fabrics and movements between the layers of fabric. It also ensures pucker-free seams in smooth fabric such as nylon or closely woven fabric. The differential feed can be adjusted by simply turning the differential feed adjustment dial in the direction desired. 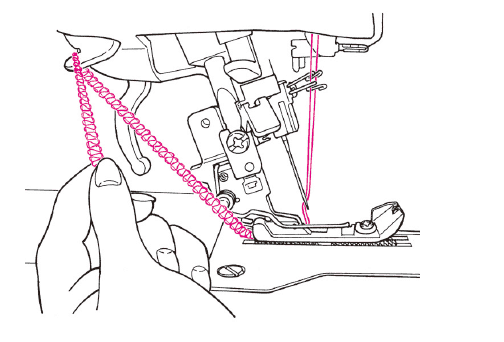 The differential feed is infinitely variable and can be adjusted while sewing. Using the differential feed, I can gather a single layer of fabric before sewing it to the garment, for example, sleeve heads and lower edges, yokes, lace edging or frills. There is a Craftsy tutorial about gathering with a serger, if you are interested. There is a small part which is very convenient – Upper Looper Converter 2-/3- Thread Conversion. I can switch to 2-thread stitches just by pushing this attachment to the left. I don’t need to cut the thread from the upper looper, I just move this attachment to the left and the upper looper thread is not fed and the lower looper thread is fed to form 2-thread stitches. 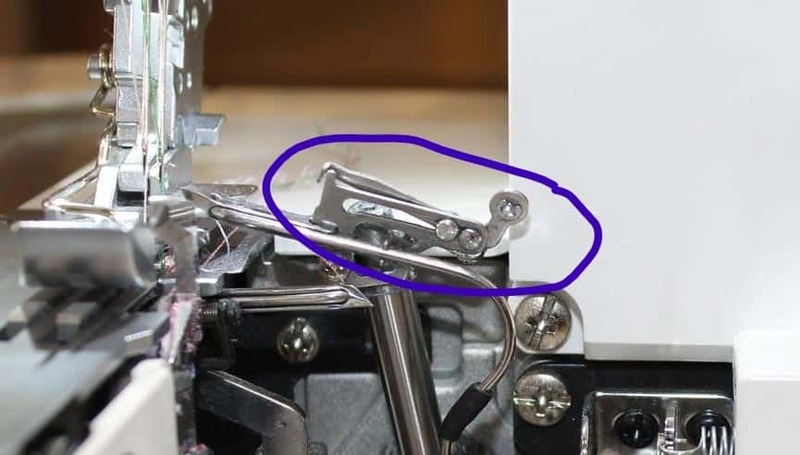 Another detail which I didn’t see in other sergers – a thread trimming blade for easy thread cutting. It is useful when removing the fabric after raising the presser foot at the end of sewing. A standard presser foot of Juki serger is equipped with a tape guide! For example, the tape can be sewn into the shoulder and side seams of garments to prevent stretching of very stretchy knits and spandex. The serger has a LED Sewing Light so the sewing area is brightly illuminated. The light is energy-efficient and eco-friendly and will not heat up even after a long period of use. There is a Waste Collector container which catches cut-off fabric and keeps the working area clean. The lower and upper knives provide the greatest, most robust cutting force even for thick fabric so all fabric edges can be trimmed professionally. 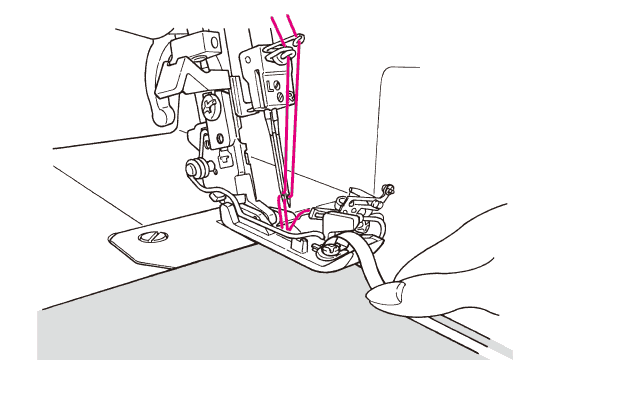 There is option to deactivate the upper knife to carry out sewing without cutting the fabric. The serger operates amazingly smooth and quiet. Juki has a wider working area so the usability of the work space improved infinitely. Juki MO 2000 serger has some optional presser feet you can buy separately. With Juki serger you can master basic serger stitches (like finishing raw edges and in the same time trimming and stitching the seams) and learn advanced techniques to embellish clothes or home decorating projects. It has 15 different types of stitches. All seams made with the serger are stretchable, so you can sew knits, jersey, spandex, lace quickly and durably. I can show you now few types of stitches I made in my trial run with the Juki serger. All of them look very nice and I am really pleased how they turned out. First setting on the machine is 4 thread overlock stitch with integrated safety seam. It looks like 3 thread overlock stitch but second needle thread is added to make seams more secure. The needle threads form straight stitches for a stretchy and durable seams. This is ideal stitch for sewing knits. 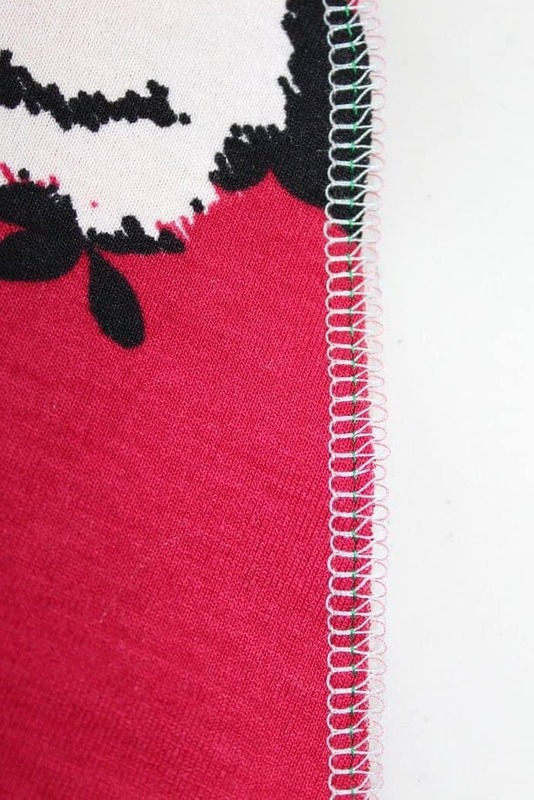 3 thread super stretch overlock stitch is most common for edge finishing. The machine produced very neat beautifully balanced stitches and cut the fabric perfectly. 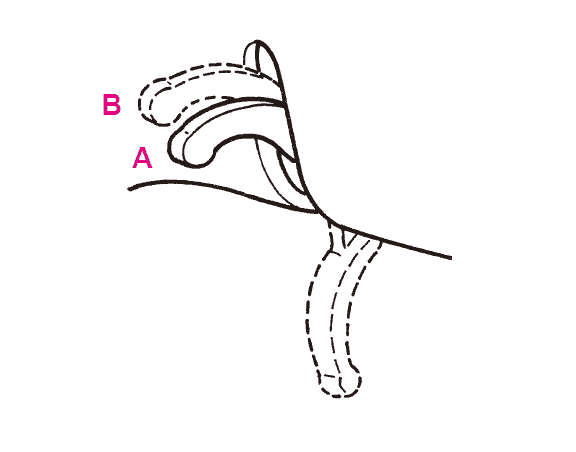 The stitch formation was perfect because both looper threads meat at the fabric edge. All three treads moved easily and without resistance. The edge of the fabric didn’t curl up or pucker. 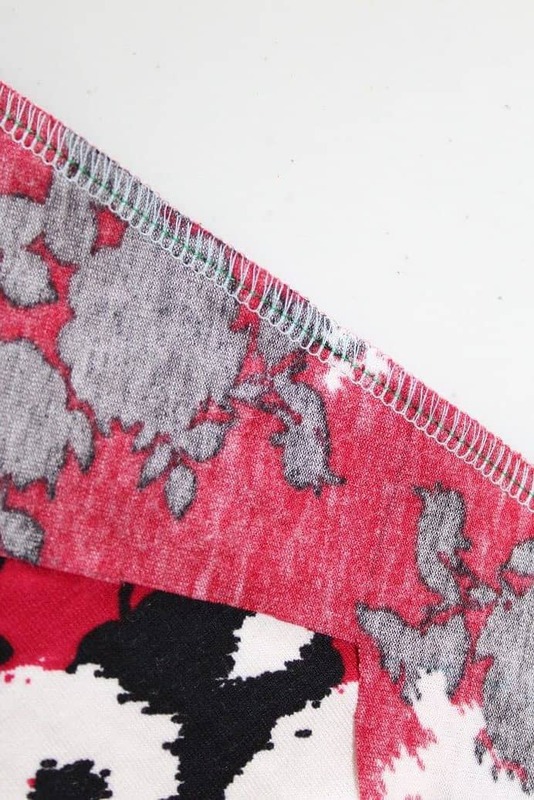 The other stitch I want to show you is the rolled hem, and this serger sews a beautiful rolled hem. You just need to remove the left needle and turn a couple of knobs which is very fast. I like to use this stitch especially for hemming chiffon garments. I don’t need to change either the stitch plate or the presser foot. The roll hemmer is fully integrated in the machine – I simply flip the special switch. The edge of the fabric will be rolled over in a flash. The machine produces a very narrow, fine seam or hem. The Juki serger provides a neat, attractive finish for a variety of fabrics from medium weight cotton to weightless chiffon. I hope my hands-on experience with the Juki serger will be useful for my readers; for me it was a pleasure to use the machine. Is it worth the price ? My answer is if you can afford it, yes, Juki is not a cheap machine but to me it is worth every penny. You will get everything you pay for and then probably some. And if we compare this serger with other high end air threading sergers (like Babylock) the price does not even look very high anymore. Where to buy this Juki serger? where this serger is sold with full 10 years warranty and expert customer service ( and by the way, they also have a very good price in the store ). They also have free shipping on all Internet orders over $50.00 to any location in the continental US. I just bought this machine yesterday. 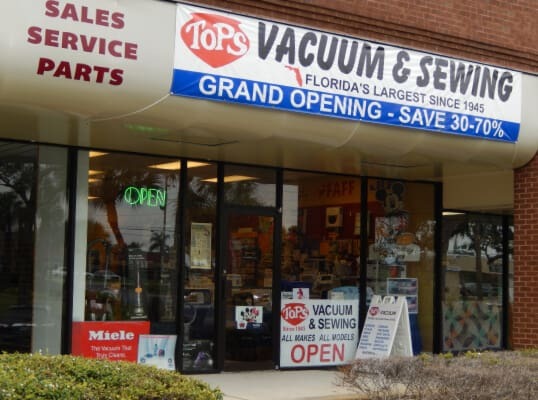 I went to Tops and the owner was wonderful! I traded my Elena serger and I am very pleased! Congratulations! I am sure you will love to use it. Did you ask the owner to show you how to work with the machine? I made some mistakes at the beginning while threading but after I learned the steps everything went ok. This serger is the best in my opinion. What do you sew? Clothing? Or home decor? Thank you – just got the same serger from Tops and Greg was wonderful. This info helped as I have not used a serger before. 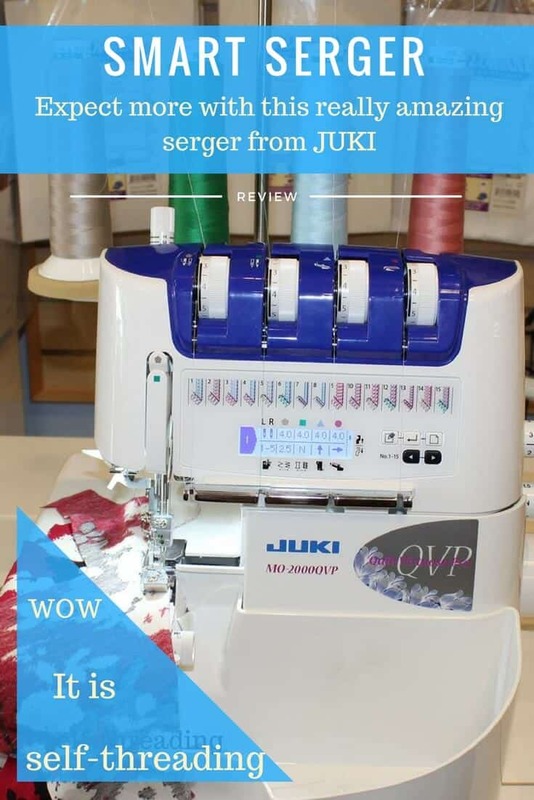 Oh, I am sure you will love the Juki serger. What do you sew? I am going to be purchasing a new serger. I have a very old White 534, which has been a little beast, but time to move on. I have it narrowed down to Juki 2000 QVP or BabyLock Enlighten. A Juki dealer within 100 miles of me has a new Juki 2000 QVP that was used as a demo for a weekend class which he will sell to me for $1199. The BabyLock Enlighten is on sale at a local sewing center which I have bought my other machines but is $1900. I would love to hear what you recommend. I just don’t know if the BabyLock is worth $800 more. It is so hard to find reviews on the Juki as everyone seems to have the BabyLock. I do some quilting but love home decorating projects, curtains, Slipcovers, etc….Thank you! A Minnesota sewer. Dalene, I didn’t try Enlighten myself but heard from my friends that it is an excellent serger. But I tried Juki 2000 QVP and was really impressed by its performance. I would choose Juki over Enlighten. But your situation is a little bit different. What if you buy Juki and you will need to repair it or do some maintenance on it? 100 miles is a great distance to the Juki dealer, and problems can happen even with 10,000 dollars Dream machines, so in my opinion, it’s better for you to buy Enlighten because you can always go with it to your local sewing center and fix any problem. You can also try the machine there and see how you like it, right? I used this at a class in Arlington,tx. The plastic door is solid with a place for tools. I have a juki qvp quilting machine and love it. This will be my toy next year. I am glad you agree with me! And it’s really a cheaper option for air-threading sergers! But only dealers sell this machine for now. Just bought one from Tops today. It was On sale plus I traded in my MO654DE and got a great deal on the trade as well. Just set it up and it was a breeze. Looking forward to using it after Thanksgiving! Enjoy! I am sure you will love to use it. It’s good that you could get it for a lower price. I was looking to upgrade my serger. So I traded my babylock Eclipse for this machine because of your review. I always had trouble with threading the machine and getting the tension & stitches right. I also got a great price and get free lessons. My Tops dealer is great. I bought this machine somewhat impulsively along with the cover stitch machine that is still on order. I’ve been using it only for a few days but I’m loving it. I do not quilt so I started to wonder if I made the right decision for garment sewing & alterations since it has “quilt” in the name. no offense to quilters out there but there are people who do other kinds of sewing so it would be hard to believe that walking into most sewing centers around here! I had done at tremendous amount of research over the years. when I stopped at the sewing store and put it through its paces I was pretty impressed. sometimes I wonder if I should have been shopping for industrial machines. I have two other sergers that I bought used but I never really felt like I was getting refined features, though they trained me in the use and care of sergers so I’m glad for having them. Has anyone tried using a heavier material with this serger, like a mid-weight canvas or denim? Thank you for commenting and for your question! I am sure you are not going to be disappointed in this machine. It handles heavy fabrics just fine. I even tried to sew real fur – it works! And this serger is not only for quilters of course.